Like many people I know I continue to struggle to find the value in Twitter (Follow me at http://twitter.com/smkeifer). Most days I just don’t know what to Tweet. Lately I find myself laying awake at night trying to think of creative things I can post to the random group of 70 people following me. Perhaps, the worst time for me was after the introduction of Twitter lists last year. For two weeks I was a nervous wreck as it seemed like everyone else was being listed but me. Then after I got listed I was worried about being de-listed or even worse un-followed by a mass of follower. And then there are the nightmares – Last month I had a dream in which I accidentally typed 141 characters into a Tweet causing a buffer overflow that crashed the whole Twitter infrastructure. But a few weeks ago I discovered another service called Yammer which has completely changed my perspective on the value of micro-blogging. Like Twitter, Yammer supports #hash tags and @ references to other users. 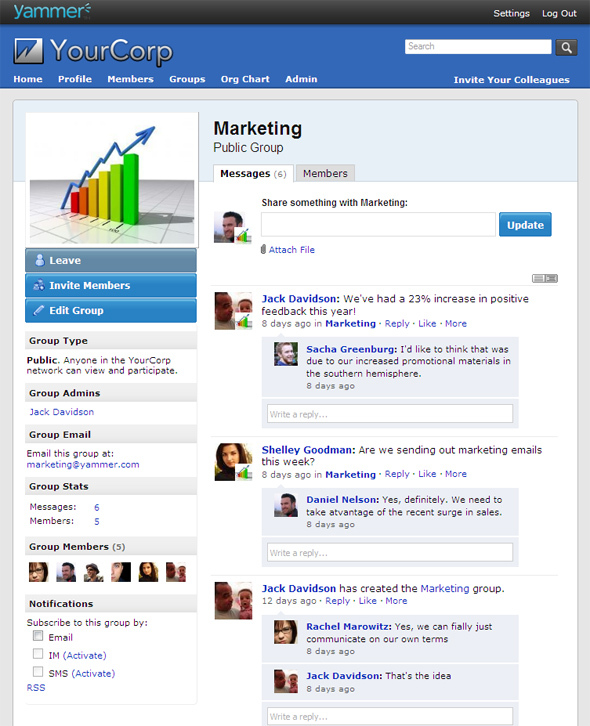 Yammer supports groups which are similar to Twitter lists. Yammer has applications for the Blackberry, iPhone, Android and Windows Mobile devices. It offers integration with Google Reader, Firefox, Twitter and Google Applications. There is a desktop client and Outlook 2003 plug-in. The application provides long-term archiving of all messages, which enables the aggregation of content into an enterprise-wide knowledge board. Yammer also creates up-to-date organizational charts based upon the manager-subordinate relationships users enter upon registration. 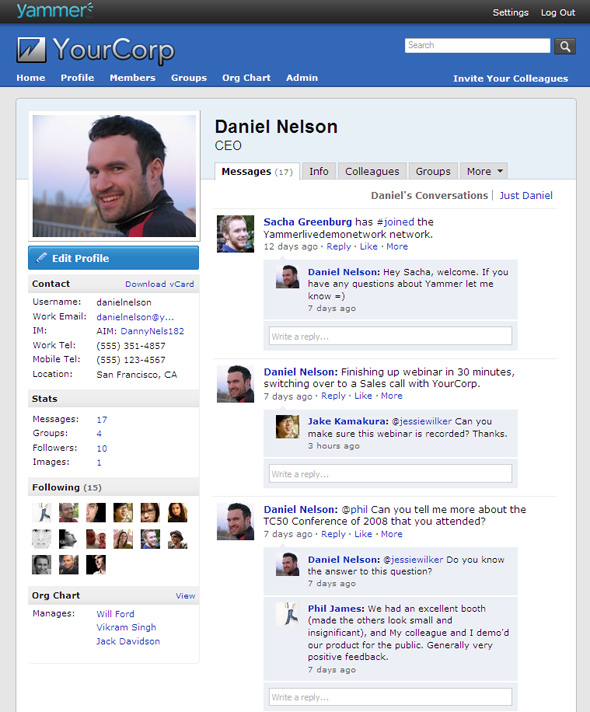 Posts to Yammer are limited only to members of your company or organization. While I often struggle to think of information that I want to share with the general public (including competitors) on Twitter, I have no problems coming up with 10 or more updates per day I would like to share with my work colleagues. For example, suppose I am leaving on a trip to San Francisco to visit a client. I don’t want to post such an update on Twitter, because my competitors might see it. Nor do I want potential criminals who might be monitoring Twitter to know that my house is unoccupied while I am out-of-town. But on Yammer, I have no reservations about sharing the travel plans with my work colleagues around the globe. Yammer has been called “Twitter with a Business Model.” Users can subscribe to the service for free. Much like other social networking and micro-blogging platforms the free startup model enables rapid community growth. Yammer’s success is created by the viral network-effect of users joining which unleashes exponential value. The free version of the service includes micro-blogging, file sharing, user groups and access from mobile devices. But here is the catch – with the free version of the service Yammer (not the company) owns all the content. As a result, once your organization has a few hundred users actively engaged, you cannot help but want to subscribe to a premium service to ensure the confidentiality of the information. The silver version of the service, which costs $3/month per user adds company ownership of the data and enhanced user administration functions such as including external users. The gold version of the service, which costs $5/month adds the ability to export member data and message information. Earlier today Yammer secured $10M in additional venture capital funding. Yammer has grown to over 60,000 organizations using the hosted service in just 14 short months after its founding in September 2008. The management team adds further confidence. The CEO is PayPal’s former COO who led from startup to IPO. Board members are primarily venture capital partners, but also include Facebook founder Sean Parker. This is one stock that I am going to buy once it goes public. Thanks for your insight on microblogging services for companies. There is value in providing a “walled” garden of sort like you described. However, there is a bigger trend happening; more small medium businesses are moving to the cloud using services like Google Apps; 20mil users & 2 mil companies adding at 3000/day. Consumers are getting comfortable with sharing information using status updates. The confluence of both factors is why I build my company Socialwok(http://socialwok.com) that you should check out. We have built a business social networking service that integrates tightly with the cloud workflow of small medium businesses. If you use Google Apps, we are your natural choice. Check us out! Yammer has been a great resource within our organization. The ramp up time took awhile to get users thinking about it and posting on it. We spent a lot of off line time contacting key individuals in the organization and suggesting, “That would make a great post on Yammer.” We feel the need for relevant content to keep people interested. Any examples of organizational success stories that you could share? You talk about the security of Yammer, but if a colleague leaves the company, they can still access the acitivity on Yammer by logging in with their old email address. Therefore, unless someone remembers to remove them, they can still access your area of Yammer, even though they are no longer with the company. I agree about Twitter though – I really dislike it. It’s just a wall of noise with few useful functions. Yes, I have experienced the same security problems with Yammer. 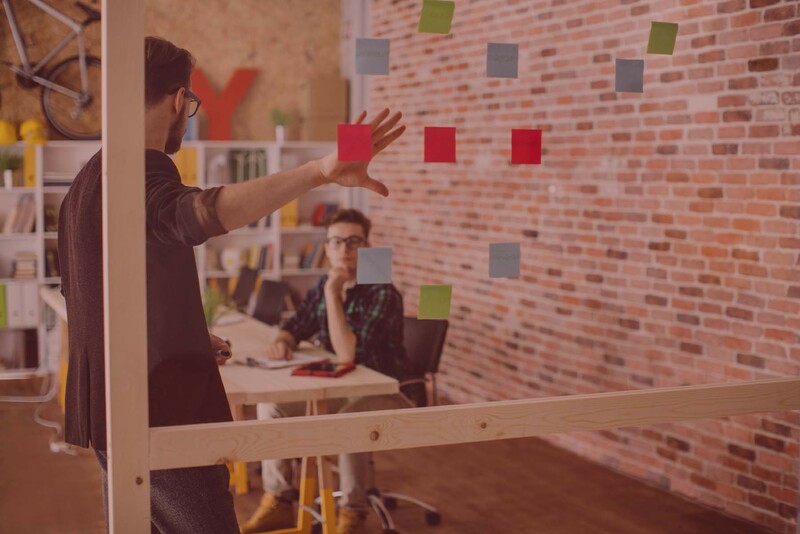 Employee departures create a significant management challenge.